extent in order to examine the basic transfer of electrons. 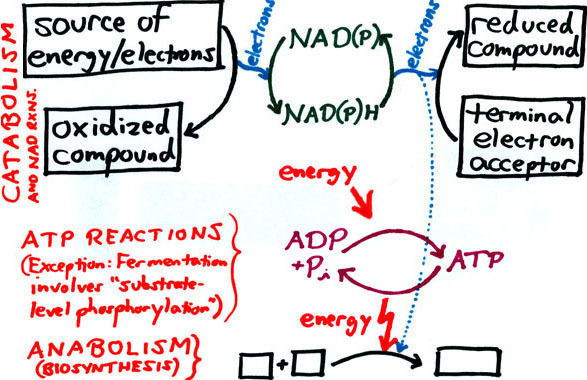 To release energy which can be used to generate ATP from ADP and phosphate. To release electrons which serve as "reducing power." Also to provide some of the "building blocks" for biosynthesis. CH2O + O2 --> CO2 + H2O. utilize chemical reactions in the generation of energy (and also reducing power). This is done by fermentation and/or respiration. In the general microbiology lab, the ability of a chemoorganotrophic organism to respire (with oxygen) and/or ferment can be determined with the "oxygen relationship test." A review of respiration vs. fermentation is given here. also oxidize chemical compounds, but the ultimate source of energy is light. "Phototrophy" is shown here as the set of light-dependant, catabolic reactions associated with photosynthesis (the other reactions of which are anabolic). To make a long story short, we can use the example of a typical fermentation pathway (stepwise/sequential chain of chemical reactions) where glucose is oxidized to pyruvate (the oxidation stage of the pathway) and pyruvate is then reduced to fermentation products such as lactic acid (the reduction stage of the pathway). At a certain step in the oxidation stage where compound A loses electrons (which are picked up by co-enzyme NAD+), the electrons can be transferred to compound C in the reduction stage (thus "regenerating" the NAD+). In the generation of ATP, the "P" (phosphate) can be "free" (inorganic) or attached to an intermediate compound in the pathway (organic). As this phosphate is transferred to ADP in the formation of ATP and does not incorporate energy associated with electron transport, the term "substrate-level phosphorylation" applies. Phototrophy can be OXYGENIC (evolving O2 when H2O serves as the electron donor) or ANOXYGENIC (non-O2-evolving). Note in these pages that cyclic vs. non-cyclic photophosphorylation is not (yet) addressed. While fermenters tend to be organotrophs, respirers can be organotrophs or lithotrophs. For respiration, we have O2 as an external electron acceptor, and the reduction stage seen in fermentation is replaced here by continued oxidation. An organic substrate can be oxidized completely to CO2 as O2 is reduced to H2O. ANAEROBIC RESPIRATION employs an electron acceptor other than O2 such as nitrate (NO3–) which is reduced to nitrite (NO2–) or N2. An attempt to produce an abbreviated summary of catabolism based on the above follows. Here we get down to the basics, leaving out cytochromes and other intermediates. 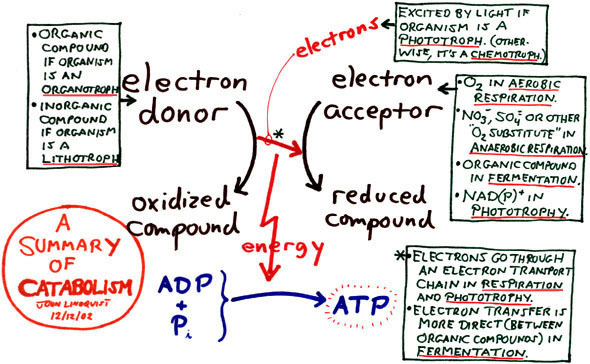 This diagram represents what generally happens at a step in the catabolic pathway where a substrate is oxidized with (1) electrons given off which can be utilized for "reducing power" and (2) energy is released that results in the generation of ATP. For fermentation (as noted above), ATP generation is accomplished by substrate-level phosphorylation rather than with energy released at such a step in the pathway. Combining Terms: Using the terms describing organisms according to their source of energy and reducing power as defined above, one can combine these terms as follows: chemoorganotroph, chemolithotroph, photoorganotroph, and photolithotroph. Considering the terminology associated with the source of carbon as explained here, one finds that most chemoorganotrophs are chemoheterotrophs (and vice versa), and most chemolithotrophs are chemoautotrophs (and vice versa). With this in mind, the following terms are paired accordingly: photoorganotrophs with photoheterotrophs, and photolithotrophs with photoautotrophs. Reasons why an organism may grow anaerobically are summarized here. A page on the Bact. 102 website summarizing catabolism and the test for oxygen relationships can be found here. and found their permanent sanctuary here circa 2001. Copies found elsewhere are neither authorized nor up to date. This page was last tuned up on 10/15/07 at 10:45 AM, CDT.